We are offering 15% off a service when booked with an mot test (the mot remains at £35.00). Congratulations to Julie Morris who won last months “like and share” competition in support of Exmouth and Lympstone Hospice Care . 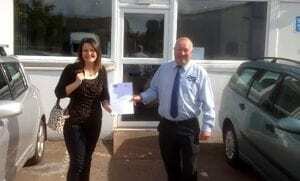 We were delighted to meet Julie today and present her with her free service voucher, well done Julie! We would also like to thank Lucy Hancock and her team for a great night at the charity fundraising event held last Friday at Woodbury Golf Park. The Exmouth and Lympstone Hospice were celebrating 30 years of care and support, great work done by great people.